The Middle East is an area which carries many stereotypes and myths. Many Westerners that have lived or worked in the Middle East might use the words chaotic, disorganized and frustrating when discussing doing business there. Although this is a matter of perception, it is true that business runs on very different tracks to business in the West. Before doing business in the Middle East it is imperative to learn about areas such as business culture, business etiquette, meeting protocol and negotiation techniques. Through such knowledge stereotypes are broken and barriers to communication reduced. The traditional Islamic greeting you will hear is ‘Asalamu alaykum’ (peace be with you). As a non-Muslim you would not be expected to use it, but if you did you would receive the reply ‘wa alaykum salam’ (and peace be with you). When doing business in the Middle East, handshakes are always used and can last a long time. Islamic etiquette recommends that one waits for the other to withdraw their hand first before doing the same. Small talk is more than just a courtesy; it is a way of finding out whether you would be a suitable business partner. Engage in conversation freely and enthusiastically, and have a few stories in your back pocket to break the ice. Decisions can take a long time, probably longer than you’re used to. Don’t be impatient, as this will reflect poorly on your character. Be flexible and prepared to accommodate shifting schedules. In fact, patience is the most valuable virtue you can demonstrate throughout your business and social life living and working in the ME. With the right people, you will find that doors open for you and rules are bent enough to accommodate you. Favors are not forgotten and often reciprocated. Choosing the right partner is critical – take your time to find someone with commercial synergy, intellectual synergy, and with political muscle and business acumen. Start with a couple small, quick deals to test the partner out before going for that mega deal. Patience is the single most important trait you need to have when dealing with Middle Eastern countries. Closing a deal, finalizing an agreement, and establishing consensus will take time. Set your expectations accordingly. Meetings may often start late, or cancelled all together due to ‘family obligations’. But you are expected to be punctual. “Do not take it personal, this is business” does not mean much for most Middle Easterners. Arabs will do business only with people they know and like. Small talk is essential for the counterparts to become comfortable with you. Trying to get down to business immediately is a sure way to fail. Humor is appreciated and is commonly used. Emails and faxes are the least personal and the least important and may be ignored until you follow-up with the phone. Body language is usually as important as the spoken word, so be on the lookout for non-verbal signals and also pay attention to your own posture. Maintain eye contact. The Arabs may raise their voice, show temperament or engage in sudden outbursts – It’s part of their theatrics .However, you have to maintain composure; not raising your voice or losing your temper is critical. So is showing confidence. Everything is negotiable, even a contract (which is seen more of a memorandum of understanding). Personal relationships and trust are more important than legal papers or man-made laws. Spoken promises carry more weight than contractual clauses. Important: Do not expect this to work in both directions. Westerners are outsiders and they are expected to follow their contractual obligations. Arabs enjoy standing in close proximity, and casual touching to the person they speak to is common. Showing signs of discomfort or moving away is offensive. Handshakes are almost ceremonial. Expect a strong handshake and expect it to last very long. Islamic etiquette requires you to wait until the other person withdraws their hand. It’s common for men to walk while holding hands. If offered a snack, always accept, and take at last a bite. You don’t have to finish it but you cannot refuse it. Tea and coffee is a feature of meetings (companies typically have a “tea man” employed) and is a mark of hospitality, so do not refuse that either. After the first one, you can wiggle your cup to indicate you have had enough. Working with the Middle East could be a curse if a westerner doesn’t know about the business culture but this curse could turn to an opportunity with an enhanced cultural sensitivity about his region of the world. Dr Nakhle holds a PhD in Human Resource Management from the University of Fribourg in Switzerland, an MBA from the Lebanese American University and a Master in Economics from the University of Jean Moulin in Lyon, France. Dr Nakhle has taught in major universities in Lebanon and abroad such as the American University of Beirut, Beirut Arab University, the Lebanese University, the Business School of Lausanne and the University of Fribourg. Dr Nakhle is a trainer in the fields of HR, entrepreneurship, cross-cultural management and soft skills. 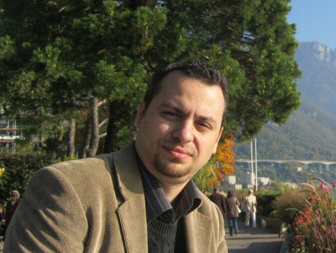 He is a researcher in the field of International HRM, Cross-cultural Management and Business Ethics.